3.04 0:16 Cruise to the finish. While in Utah, I knew I was going to be coming to Arizona for a new job and new life adventure. 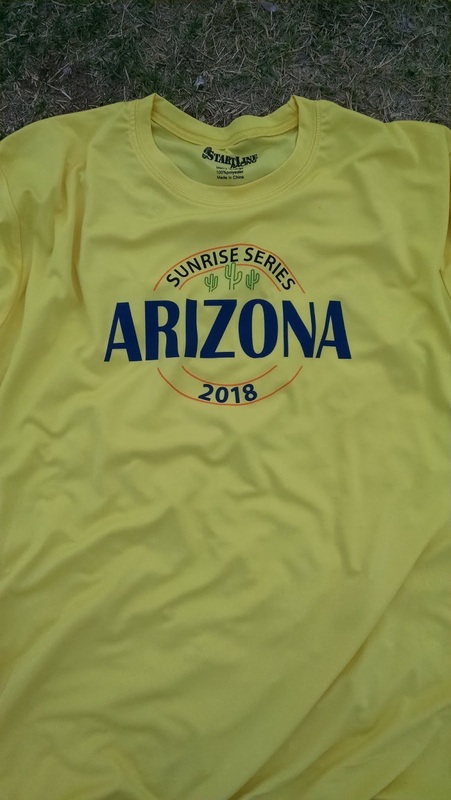 A fellow runner friend sent me a link to a series of races called the Arizona Sunrise Series. 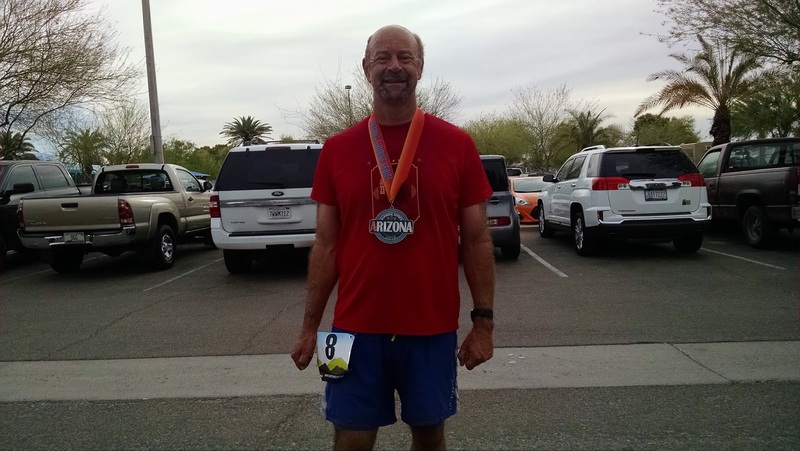 For $170 I got entered into 7 5K races around the Phoenix area. 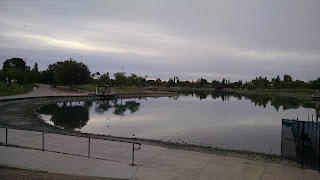 I figured it would be something to do and give me a tour of the various running areas around the metro area. Today's race was race #1 of the series. 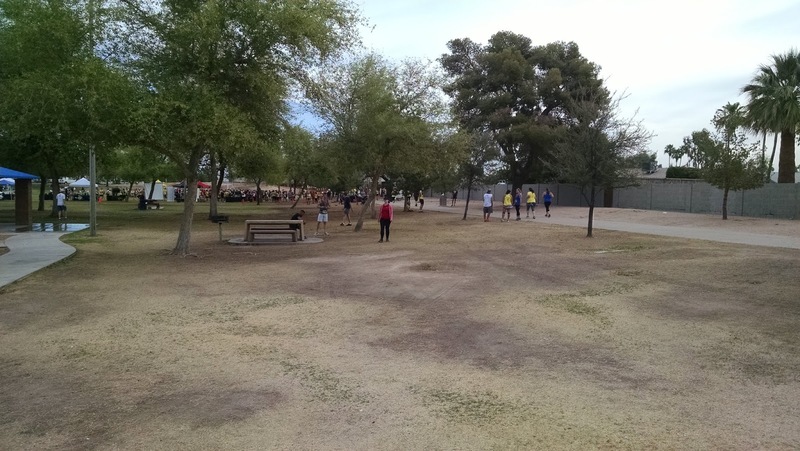 Today's race was held at Kiwani's Park in Tempe. It was about an 8 minute drive to the race site. I got there about 45 minutes early, which was great because another 15 minutes later people were lining up just to find a parking spot. I grabbed my bib from a super well organized distribution system and walked around the park taking photos. 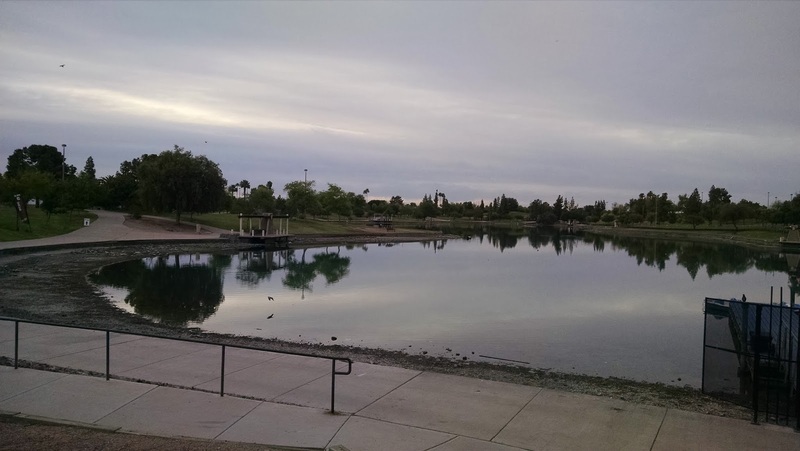 The park was under repairs / improvements, so running around the lake wasn't an option today. I'll give major props to the race director (www.startlineracing.com). He had it down to a system and he had a countdown clock so you knew when the race was going to start. For a 5K they even had some vendors. I started about 40 - 50 people deep and for a race of this size it was a little crowded. 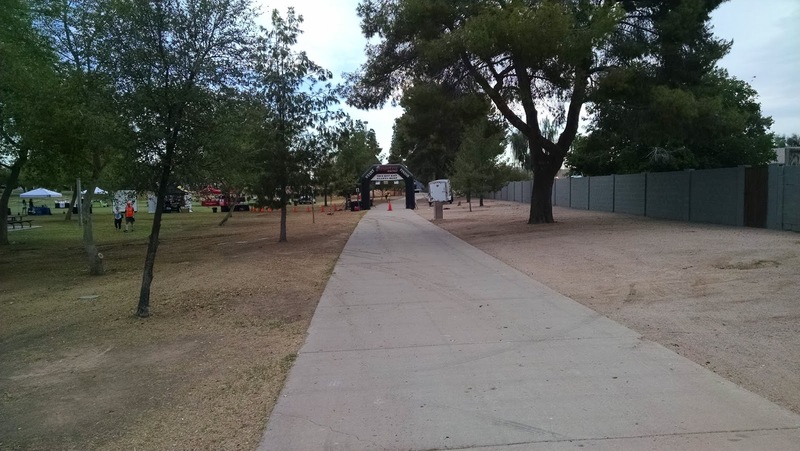 The race starts on a concrete sidewalk that was maybe 8 - 10 feet wide. Luckily people were courteous and had lined up correctly. I was hemmed in a bit, but after about a third of a mile, I was free to roam. Also the first half mile or so has a lot of rolling hills. While they aren't super huge they certainly affected my pace. You'd run a few hundred yards, ascent a short but steep hill and then descend down the other side. It made for tough, uneven running. 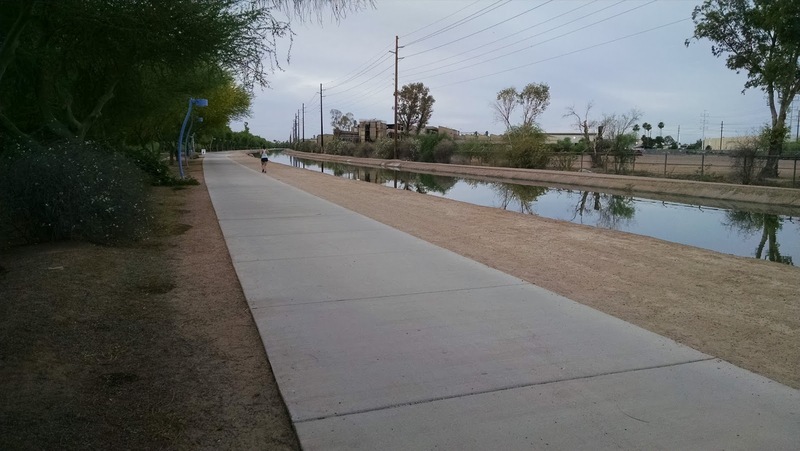 After the half mile you are back onto the flats and eventually onto the concrete paved canal trail. This is pancake flat here and I found myself able to hold a fairly consistent pace. I was hurting and I didn't feel particularly speedy. But I was holding my pace and occasionally passing another runner. The turnaround point was at the west end of the trail and I realized the course was going to be a bit short. My watch read 1.53. I talked to some other runners and they ran 3.07. So I think the course ultimately was a little short. I had moments were I felt my pace was rocking and others were I knew I was in trouble. I didn't have the kick I was looking for this morning. 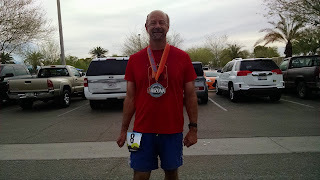 However, thankfully this was a 5K and I had plenty of endurance to at least maintain my pace. The final half mile stretch was again rough as I had to navigate the rolling hills. I think there were more uphills than down on the way back. My Garmin is pretty much telling lies in that there was only 6 feet (or so) of elevation change. I pushed through the final stretch and crossed the finish line just under 25 minutes. Clearly this wasn't my best 5K race. Looking at my Garmin report, it looks like my foot pace was good for about half a mile and then my turnover wasn't so good. I had done a pretty good warm-up beforehand but I was just sort of flat today. There was a lot of competition today as well. When I got there it seemed like every wiry middle aged guy in town was there. So it wasn't very much of a surprise that I didn't place in my age group. I got a honking big medal at the end of the race. What is cool is that for each race in the series that you complete, you get an additional letter to place on the medal, so by the end, if you do all the races, you'll have the word Arizona in big orange letters. After the race I grabbed a Kind bar from a vendor. They had water and a decent selection of fruits and so forth to replenish on. Also they had a bunch of TVs scattered around the finishers area where I could check my results. 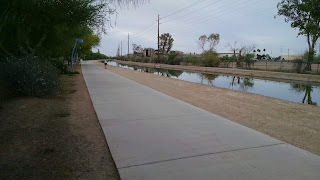 I had a bit of time to kill afterwards and I wound up doing a cool off run along the canal trail. 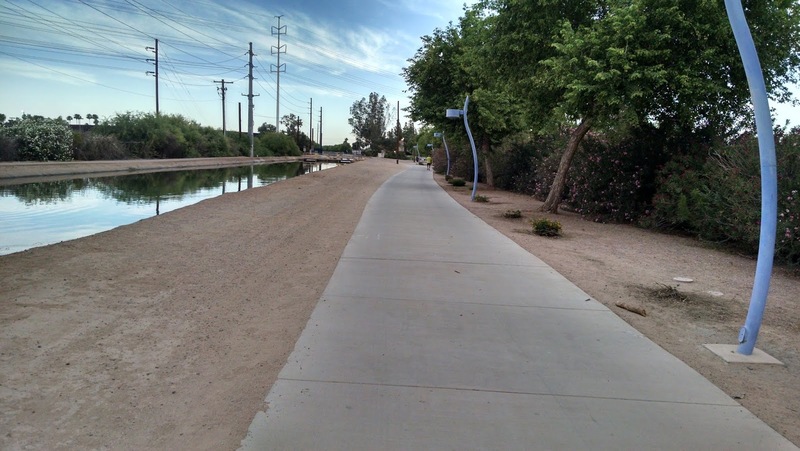 I definitely could see myself using this trail for a decent long run. 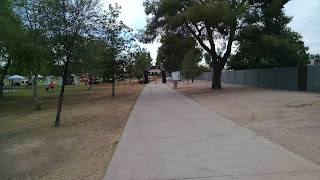 It wasn't terribly scenic, but it was flat and ran along near some parks for bathroom / drinking fountain access. Looking forward to the second in the series, in two weeks!